Welcome to the Under the Rainbow Giveaway Hop, hosted by the Blogging Mamas Network! From March 1st-17th, you'll have the chance to win plenty of prizes from over 50 bloggers to celebrate St. Patrick's Day! So after you enter my giveaway, make like a little, green Leprechaun and hop around to all the other blogs participating in the Event! What will YOU find Under the Rainbow?! 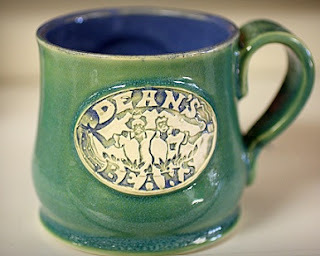 What about Organic Coffee from Dean's Beans! This Javatrekker Survival Kit comes with a book on Fair Trade Coffee, and a selection of coffee from 6 of the places trekked in the book. What a fun way to experience fair trade coffee and make it real for you. "Dean's Beans Organic Coffee Company is a Pioneer in the coffee industry with an unyielding commitment to peaceful social change, environmental responsibility and sustainable business practices." Fantastic coffee, brews so nicely, the smell is out of this world, and the organization itself is fantastic! I will never go back to purchasing coffee unless it is Fair Trade. Makes such a difference to the small farmers and workers in other countries. Dark Chocolate Java Drops are the perfect afternoon snack and pick me up. I LOVE them! Organic Hot Chocolate Mix is perfect for these cold days. And a beautiful Ceramic Mug to hold your fair trade drink. According to Jenny, So Easy Being Green, the Blogging Mamas Network, and the Under the Rainbow participating bloggers are not responsible for sponsors who do not fulfill prize obligations. A Year of Jubilee Reviews received free product to conduct a fair and accurate review. All opinions expressed are solely my own. Thanks for this opportunity. Prize looks great. SkyFall and Urban Daddy Giveaway!! Bring home Christie's Baby Girl! !